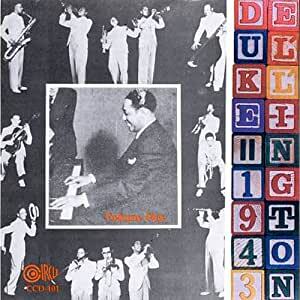 This is the first volume of Circle Record's release of Duke Ellington's World Transcriptions, recorded on November 8th and 9th of 1943, after Decca Studios signed an agreement with the American Federation of Musicians, beginning the end of the recording ban during which so much good jazz music was lost to posterity. "Transcription" was recording jargon for recordings made in studio for sale only to radio stations and other non-public purchasers; this strategem was one of the responses to the sense musicians (and their agents) had that they were not well recompensed for radio play of their 78's. These special recordings were quite different in type from those available to the music-buying public; the discs supplied to the stations might play outward as well as inward, and they afforded the musicians longer playing times than the 78 did. 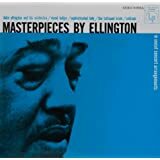 Of more immediate interest to modern listeners is the sound quality of these recordings; they are the best I have heard up to this time, in part, I imagine, because they are in fact transferred from masters rather than surviving 78's. And, the point of it, the music itself is excellent. 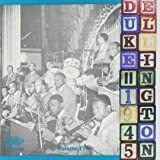 It's true that several stars of 1940 are missing: Cootie Williams is gone, Ben Webster as well, the great Jimmy Blanton is dead, and Barney Bigard has departed. 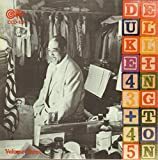 But by the time of these recordings, Cootie has to some degree been replaced by Ray Nance, now a prominent trumpeter, and, in my view, as good a singer as Duke ever had. Junior Raglin is, really, quite as good a band-driving bassist as Blanton had been, though no one would claim he compared as a soloist (did anyone, till Scott LaFaro? ), and we now hear the rather celebral but always incisive clarinettist Jimmy Hamilton. Only Webster leaves an unfilled gap; his replacement, Skippy Williams, is competent, a limited low-voltage Hawkins, but not a memorable soloist. 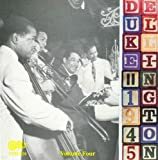 Taken as an ensemble, the orchestra is playing as well as they ever had, and Hodges, Lawrence Brown, and Stewart (soon to be pushed out by Duke, for reasons I've never understood) stand out as previously. 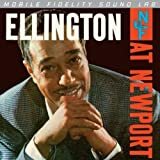 Sonny Greer is missing from many of these recordings, ably replaced by the sub Hilliard Brown (nothing on him in Grove, no surprise). Al Hibbler replaces the deep crooner Herb Jeffries (star of "Flamingo"), and, though he displays very little true jazz ability, he is, to my ears, a much more effective singer; the version of "Summertime" on this set is as well sung as any I have heard. 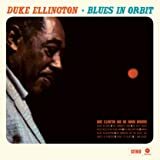 As the Amazon record indicates, many tracks are alternate takes or breakdowns; these may irritate some listeners, but Ellington aficionados will probably enjoy hearing such inpromptus as the breakdown of "Summertime", in which Al Hibbler feels called upon to soothe an argument arising from "who fouled this up? 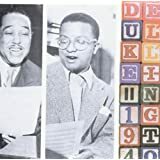 ", and Duke's sudden call for "BOY MEETS HORN BOY MEETS HORN" after yet another unsatisfactory take of Mary Lou Williams' arrangement of "Blue Skies". 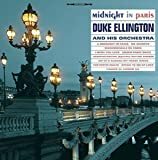 My own favorites on this CD are "Blue Skies" (in spite of Duke's dissatisfaction, more interesting than the Musicraft version a few years later), "Boy Meets Horn", superior to the 1938 recording, I think, though surely Stewart must have tired of playing this "freak song" by then, "Tea for Two", with its clarinet trio, and, of course, Johnny Hodges' solo on "Sentimental Lady". 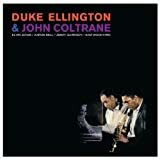 The liner notes were written by Eddie Lambert, author of the very useful "Duke Ellington : a listener's guide."